Sign up NOW for your FREE account. 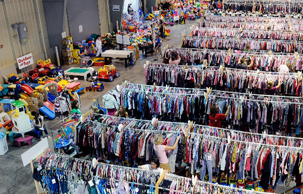 You can choose to sell items and also register to HELP OUT at the sale to shop early, too! Don't have time to TAG? We have Valet Service! More info below. Bring your items to drop at the time shown below. If you want to donate anything that doesn't sell, you're done! If you want to pick up unsold items, see times for that, too. ...and 2 weeks later, your check is on its way! Clean your closets, cash in your pockets! JBF Fresno Consignors earn an average of over $300 at each sale! Earn 65% on your sales (70% if you can help onsite during the sale for at least 4 hours), less a $15 consignor fee. Too busy to tag? Try our Valet Service (more info below)! Consignors and Team Members get to shop presales before the public to find the best deals FIRST! - If you consign, you'll earn 5% more - 70%! Help is needed with everything from handing out flyers before the event to organizing merchandise onsite, setting up, during sale week and breaking down the event. Be sure all your items are tagged and ready (see info below) Clothing and items sorted in size & type order helps speed up your drop off. Get your presale passes - Still time to volunteer, earn extra 5% and get in early! Inspection tables for clothing and shoes and then place items on the floor in correct locations. At 10:01am monday morning remaining items are donated to charity. Sorry, no exceptions! Bring season approved items.. check the what's acceptable list if unsure. Be picky. Look at your clothing items as if you were going to purchase them. No stained or damaged items will be accepted. Please freshly clean your clothing items. Replace missing buttons, sew loose hems and seams, and clip loose threads. Please button all buttons, snap all snaps, zip all zippers before you arrive at drop off. This will ensure that there are no defects in the clothing. The newer the item looks (and the better it smells), the better it will sell. Package & Hang: Hangers - Please hang clothes so the hanger hook points to the left (like a question mark). 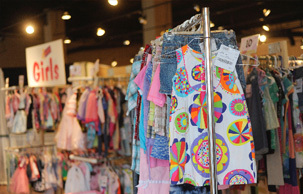 Hang size 0-6 clothing on child-size hangers and sizes 7-20 and maternity clothing on adult-size hangers. Clothing that falls off the hanger onto the floor does not sell well. Old Navy and many outlet stores are great places to get free hangers (they throw away hangers daily!) and WalMart & Target sell child-size plastic tube hangers at a great price. Clothing Sets - Sets tend to sell better (under size 6) so match things up if you can. All garments should be hung with the hanger hook pointing left (hanger should resemble a question mark when looking at the front of item). Safety pin or use a tagging gun to attach clothing sets securely with bottom garment hung on the backside of the shirt, so both pieces can be viewed without separating them. Pants/Shorts - Pant-clip hangers are great but if you use a standard hanger, simply use your tagging gun/safety pin to attach pants to the top part of the hanger so the garment will not slide. Onesies, socks, tights, hats and infant mittens need to be in a clear zip-lock bag (you may group multiple items in one bag). Please be sure to label your tag well so that customers know if the items are short-sleeve onesies or long-sleeve onesies. Exersaucers, swings, high chairs, changing tables, cribs (Manufactured AFTER June 28, 2011; please bring Crib Waiver for all cribs), strollers, bath seats, baby walkers, car seats; car seat accessories must be checked for safety recalls, must have all parts, and be in good condition. Children's furniture - beds (toddler, twin), desks, side tables, dressers, etc. Household furniture - please see Mommy Mart information below. Package: Fasten shoes together with zip ties or ribbon. For infant shoes or small shoes without laces, you may put the shoes in a clear zip-lock bag. Diaper bags, infant carriers, backpacks, and purses are great consignment items. Please inspect all items carefully to make sure items have not been recalled, stained, damaged or are missing pieces. Household items that other families will use (no knick knacks please). You may consign storage solutions (baskets, bin, shelving), furniture, seasonal decor (no antiques), and new regiftable items. Crafters Corner: Do you have extra scrapbooking supplies or too many stamp pads to count? need Extra Barbs for your tagging Gun or more Cardstock? The better your items look and smell the better they will sell! Plus you don't want your items to be turned away at inspection. If you qualify, please request a Valet Consignor spot. We will contact you to confirm your spot and schedule merchandise drop off. If you have less than five stained, damaged, or unacceptable items pulled at drop off or during the sale (and zero recalled items), you will be added to a list which allows you to skip inspection during drop off at the next sale. This saves you lots of time at Drop Off!